Order now to increase walk in traffic, give as a thank you gift, business referral or more. We have 2 choices – 8 ft deluxe # DX-1000 (198.00) or 8 ft standard # XS1000 (165.00). 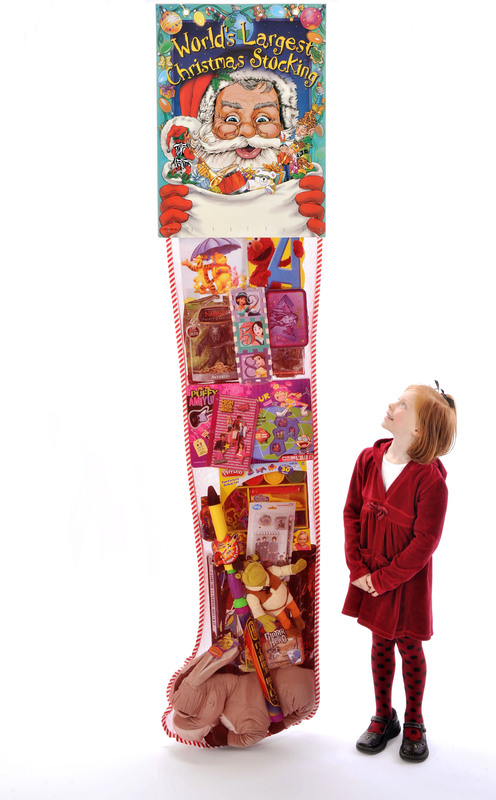 Also available in 4 ft. giant Santa Bag (same regular price as deluxe 8 ft) filled with 20-22 licensed toys. Also a great fundraiser for churches, hospitals and schools. Included with 8 ft stocking: one ballot box, 1000 entry tickets, 2 posters announcing the event and hanging instruction kit. Red mesh sock. Deluxe ones filled with 90 percent licensed toys and games, standard one filled with 60 percent licensed toys and games. Great for lobbies, schools, businesses to increase walk in traffic or to give as a raffle prize. Comes with box and entry forms. Absolute last day to order with ground shipping is Tues Dec 4, by noon eastern.